Move aside Khairuddin Hassan, Matthias Chang and Tony Pua ... The hero is Justo, says Clare Rewcastle-Browne. 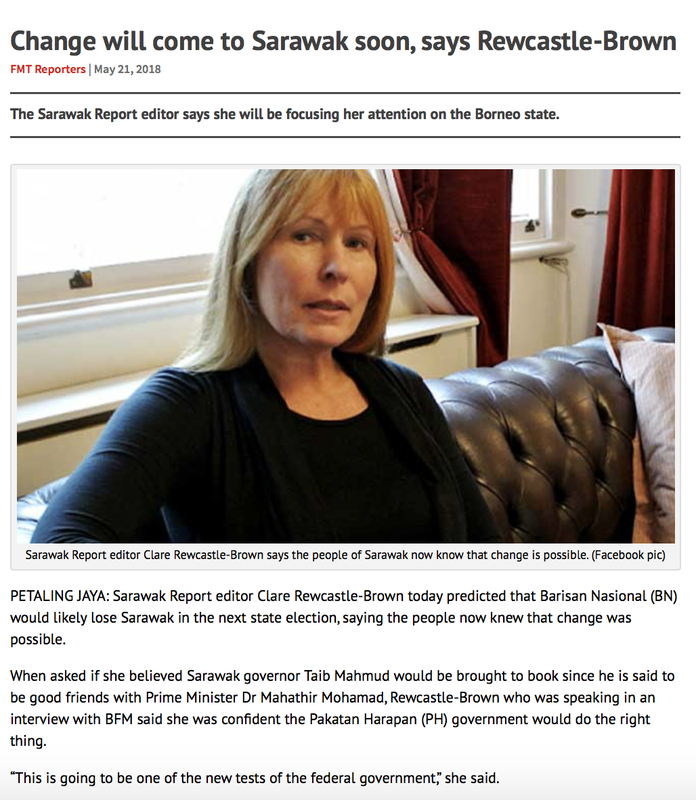 Clare, the Sarawak Report editor, is in town. Her travel ban to Malaysia has been lifted by the new Government, which is clearly indebted to her. And especially to ex-convict Justo, who had an audience with the new Prime Minister. 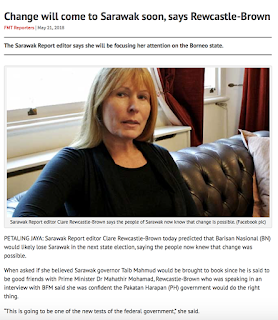 Three weeks ago, Clare was ordered by a court in the UK to pay Ustaz Hadi Awang of PAS RM155,000 for defamation. Today she's a goddess. Tun Taib Mahmud, you may be good friends with Tun Mahathir, but you're next! Try to get something clearer than this okay !! Why you so weak these few days ? Is it because now you know that "gajah is elephant" !!! Whose current PM wanted to meet is not the matter.The matter is what information obtainable the priority. Or...memang dah tak kuat lagi kot !!!! Last time i read in your blog Arul was sort of like a saint or something..
Aren’t you one of the 17,000 “political appointees”? Give up your spinning lah..you won’t be getting paid for it. I guess the good ship Dignity has long sailed so you have to keep on spewing rubbish. Such a shame...you had some respect in the past. I remember the days when you had scores of comments for the pieces you wrote...these days you’re lucky to get 10. Hope you saved for a rainy day as the gravy train has come to a halt. Sad, sad man. Awwwwwwww, you sound a tad bitter, kawan? "Her travel ban to Malaysia has been lifted by the new Government, which is clearly indebted to her." Some of the 4.5 billion USD stolen might be returned to us now. We're certainly not indebted to failed hack journos who were unable to cover up their masters' massive wrongdoings against the people, see Latuk? 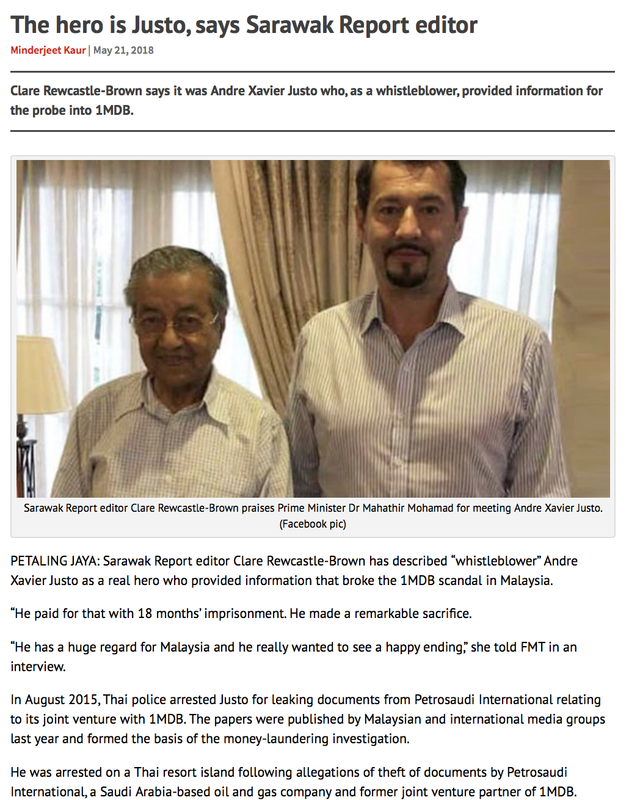 "Three weeks ago, Clare was ordered by a court in the UK to pay Ustaz Hadi Awang of PAS RM155,000 for defamation." There has been no trial. That was a payment to court to amend SR's defence, in view of new evidence. Old dog cannot learn new tricks, what? Wake up! Your thieving lot is out. Soon they will be coming for you and your 'fake' news. This time Najib's "research bureau" will not help you. You sound bitter. Against your better judgement, you quote NST on Claire's case. But what can be said about you anyway? You used to be an Arul Kanda fan boy. Who is your paymaster now, I wonder? What happen to your friend Arul, whom you praised so much, bro? Arul Kandak don't know what 1MDB invested in and what the value of the investments are. Haiyoyo... member sudah panic, now don't know what 1MDB's investments and value are. Finance minister said that Arul was so confidently saying things before government changed hands, but now pleads he doesn't know and is uncertain about many things... that he is disgracefully dishonest and untrustworthy. Your UMNO boss, Najib, tipu you all nicely already la! Why, bro, you support these fellas buta-buta before? Now you feel the pain, right? Itulah bro, sepandai pandai melompat dulu, now you sudah senyap oredi. So datuk rocky, can 1MDB pay the debt or not? Done You were very supportive of Arul Kanda, what has happen?? What say you now? dengar cerita brader sedang dok cari askar-askar blogger untuk menyiapkan kepulangan dia kepersada politik. you know, like add the intellectual sheen to his bs. the xtra bucks can come in handy bro. A good Opposition leader, like Kit Siang? Who, actually, won the election? Best music video for GE14?